Behind the Bastille is an area that is a little rough around the edges. It’s filled with restaurants, bars, and late-night activity. Le Bistro du Peintre sits on the edge of this section. I stopped here during a chilly, rainy summer evening. The outdoor seating has a nice heater and lighting for a comfortable place to enjoy a meal and a book. Luckily they also had a couple vegetarian options. While I was in the mood for a salad, their eggplant lasagna sounded like a better choice. The lasagna comes in a small terrine with layers of eggplant and sauce. It’s not your traditional lasagna with gobs of sauce and cheese. This is a lighter version with a slightly spicy sauce. This also came with a mozzarella and tomato salad and rustic bread. The salad was nice, but had some crunchy bits that made me wonder if the lettuce was washed completely. It had a healthy portion of fresh mozzarella and a sampling of tapenade for flavor. As I mentioned earlier, their outdoor seating area was quite comfortable. I pulled out my French history book and enjoyed reading for over an hour while watching the rain come down in heavy sheets. Evenings are special in Paris during the summer. 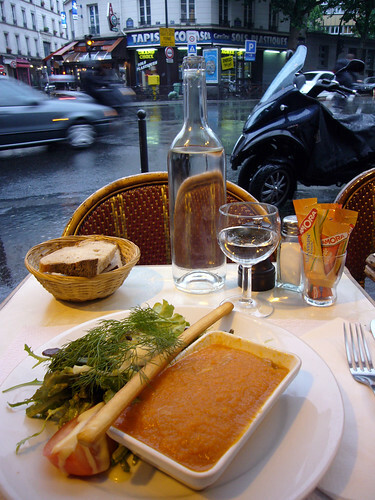 A hearty meal, a good book, and a comfortable chair are what Paris memories are made of. Le Bistro du Peintre also has a good reputation for the standard meat-based bistro dishes , such as tartar, duck confit, and marrow bones. So this is also a good choice if you are dining with a bunch of meat eating friends. Paris is filled with niche restaurants, cafes, and bars. You can find cafes that serve massages with lunch (No Stress Cafe), cafes centered around philosophy, technology (La Cantine), there was even a restaurant whose dining room was in complete darkness. Pain, Vin, Fromage is a new niche restaurant worth checking out for lacto vegetarians. Pain, Vin, Fromage features 50 artisinal cheeses and 40 wines available by the glass or bottle. They also serve charcuterie (sausages, salamis, and other meat products). They are a new restaurant in the Marais/Republique neighborhood. It may take a little bit of searching but looks like a nice place for those that enjoy cheese and wine. I didn’t have time to eat here the night I discovered it. However, the menu and restaurant looked interesting and unique. The prices were reasonable, the clients were happy, and the location is great. They also offer catering and group parties. Chez Prosper – 11th Arr. Sometimes you need a stick to your ribs dinner. 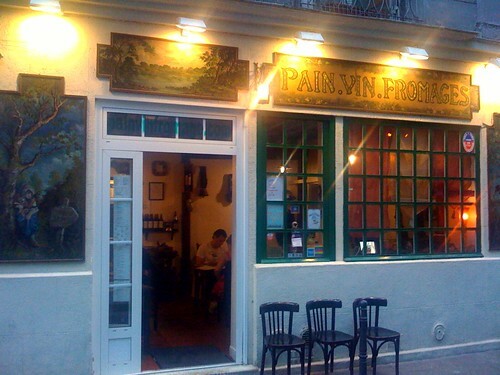 Sometimes you need a joyful place to eat with noisy locals and waiters with a sense of humor. Sometimes you need a place you can always count on for a good meal. Sometimes you need all of the above. Chez Prosper is a busy bistro tucked into the corner of Place Nation. It sits in the shadow of an old tax collecting station from the old gates of Paris. It’s a retro-bistro that looks as if it has been serving the masses for the past 100 years. It’s not a vegetarian restaurant but it does feature one of my favorite salads of all time. The Salad Chevalier is simple, yet ultimately satisfying. It starts with a layer of greens, tomatoes, and cucumbers. Then a heaping layer of sautéed potato slices are added. Topping off this salad is a tartine with three melted cheeses. Salad dressing is provided in an old coke bottle for you to use as much as you like. Personally, I pour on this sunflower oil/mustard dressing. I’ve never left Chez Prosper without being full, happy, and satisfied. If your meat eating friends are like mine, they’ll enjoy the salmon in blue cheese sauce and the steak tartar. I also recommend the dark chocolate tart with extra crème anglais for the finale. 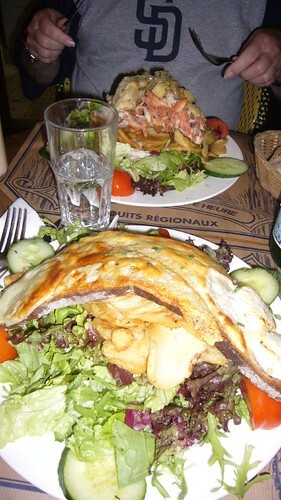 Pros: Chez Prosper is a great value for your dollar, the Salad Chevalier will cost around 10.50 Euros. No reservations are required. The bread is bottomless. The staff is contagiously happy. Chez Prosper has two sister restaurants with slightly different menus. Cons: It can get crowded, noisy, and smoky indoors. But that is what you’d expect in a popular Parisian bistro.